I had a very lonely childhood, partly because of my own crippling shyness and quirky personality and interests, but also to a large part because of my circumstances. I was the result of a bi-cultural marriage and was born in a country and to a family unaccustomed and perhaps slightly hostile to outsiders. I was, for a while, the only girl in my extended family, and whenever I was around other children, it was older cousins— always boys— who didn’t mind having an extra ultra-skinny player on their team or someone to put blame on when a prank turned sour. To the rest of the world, especially to other children my age, I was an enigma; too polite, too sensitive and quiet, and always with a book in hand. I was, not surprisingly perhaps, always bullied and picked on. It all turned out to my benefit, and I now look at those days I once considered horrid with tremendous fondness and even a sense of nostalgia. It was nice to be oblivious and entangled in my own cocoon of reality. I remember as a child being constantly consumed by the desire to save the world, and having no one to play with, always retreating to a forsaken spot in our very big garden. It was farm-like, just a big span of land pillared with trees; pines, olives, figs, cherries and lemons. Parts of it were neglected and it was so big that small life could always be found circling tree-trunks, under rocks and fallen cones, scurrying for cover or fallen from their nests, chirping for their mothers. Those little creatures were my friends and those years I spent curiously and for hours watching marching ants tirelessly transporting food crumbs, or pink earth worms twisting and dancing when uncovered changed my life and my perception of the world forever. I was fascinated, utterly fascinated with the labored movements of snails, or ladybirds spotting the walls of my bedroom and hibernating in winter. I remember sitting for hours on the edge of a pond in our garden and watching the dead floating carcasses of thirsty insects, all having sought a drop to quench their thirst but having drowned instead. It broke my heart; a life, big or small, had suffered and was over. I used to sit with a branch, waiting to detect any movement on the surface of the water, maybe I could save one, and on the days I did, I always observed with a sense of relief and accomplishment as a rescued bee meticulously dried itself and flew away, thankful for a second chance. I smile now at my childhood sensitivity and idealism. I suppose being a skinny lonely girl I always had an affinity for weaker creatures that needed love and protection. What does this have to do with Fido? Fast-forward 17 years. I am, perhaps, as one can expect from this story an animal lover and a vegetarian. But in addition to my vegetarianism, I have also one very strict rule to which I abide, and it’s that I never ever kill anything, anything! If I can save it, move it, roll it on a piece of paper and toss it out the window, even if I scream and am covered in Goosebumps as I do, then I will. It’s not that I have a God-complex or that I am in any way religious or believe that an insect is a reincarnation of someone or something. It’s simply that I love and respect life, all life and all life forms. Perhaps growing up in the Middle-East has something to do with that. Death is such a constant, you are reminded of it wherever you go, it’s in the newspapers and on TV all the time and there’s no escaping it. Maybe it’s simply my objecting to how easy it is to kill, to thwart a life and blow out a candle because we, intelligent and superior species that we are, think that the lives of other creatures are insignificant, less important and less meaningful than ours. If they are smaller, that much smaller, then they must feel less pain, right? Maybe it’s just my childhood idealism that never went away. I think of a George Bernard Shaw quote: “Animals are my friends, and I don’t eat my friends.” If I could tweak and add to that, I’d say that all life forms are my friends, and I don’t kill my friends. A few years ago, on one of my trips to Iran, a country in which one half of my family-tree resides, I met Fido. Fido was my aunt’s new pet. Her son, as she likes to call him. He is a beautiful white terrier, too withdrawn, too shy, and yes, too sensitive. We hit it off immediately. My aunt was having a few unexpected troubles with being a working woman and a dog owner in a country like Iran. Simple things such as taking the dog out for a walk in the park were episodes that invited anger and frustration as concerned and overly religious mothers and park-goers complained about dogs being “unclean”, and how their children played and sat on those spots where dogs marked their territories. I remember a very bitter elderly woman who started yapping at me in Farsi about leaving the park with the dog, and when I refused to leave saying that I had every right to be there, she actually called security; a thick-mustachioed man escorted me out, parroting the same words about religion and dogs’ un-cleanliness. Fido was stuck at home, playing only in the very small yard of the house, searching for any opportunity to escape the large gates and run outside. Furthermore, the Iranian Government had issued a law prohibiting taking dogs on drives; if a dog was spotted in a car, you’d get a very expensive ticket and a severe talking to. They might even take away your car and keep it for a few weeks. Fido was confined. 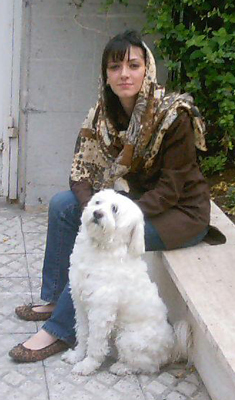 I started waking up extremely early to take Fido on walks while the streets of Tehran were completely empty. I started sleeping extremely late so I could take him to the nearby park at night when no disgruntled mothers or pious humbugs could see me. I begged and pleaded with my aunt to take him for late night drives every once in a while, just around the block, away from the main streets where the Morality Police and strict policemen could be lurking. I’d hold on to Fido’s warm body as he stood on his front paws and stuck his head out of car, wagging his tail and awestruck, looking at the speeding world with all its momentary glamour. Whenever I spoke the words “Walk time” I’d see the usually quiet dog turn into the Tasmanian devil, yelping and excitedly pouncing on me, often running all over the house in search of his leash. Fido grew fonder of me because he started associating me with good things and happy times, and I really loved seeing him happy. But there was one more thing that truly baffled my aunt about Fido. Fido only lost his mild temper when any attempt was made on any insects around the house. If my aunt or granny spotted an insect and made the mistake of trying to kill it, the dog went frantic, barking and growling, and standing between the bug and the executioner. When I first saw it I couldn’t believe my eyes, all my aunt had to do was scream certain words like, “cockroach”, “snail”, “insect” or “pif paf” for Fido to forget everything and to jump to the rescue. His compassion touched me so deeply I was moved to tears. I was the only person he let near, trusting me not to hurt what he was so viciously protecting. The world is so vast and we are not alone. When my family wants to tease me, they remind me that only a dog could grasp my sensitivity. That’s fine. I don’t expect the whole world to think like me, do things like me or approve of my ways. That would be a bore anyway. But it’s easy to forget how much in life we take for granted, and how, if we care to look, little lives and tiny miracles are taking place all around us. A little bit of sensitivity never hurt anyone. And big or small, life is to be allowed and cherished. Truely. magnificent and toching story, make you wonder about the world around us. Thank you for taking the time to comment on my story. Blessings! Sherveen, I am touched by your story and deep connection with Fido. So glad my story resonated with you Rose. Thank you for your kind comment. Happy Holidays. Just like W. Bruce Cameron did with his novel, you’ve managed to capture the incredible spirit of a dog that touched your heart and put it into words, we thank you for sharing this here with our readers, who are sure to understand what it is you feel! Please feel free to share more with us in the future! Ah, what a compliment! Thank you so much for your thoughtfulness and support. Happy 2012. Lovely story, so touching. You are a beautiful writer with a beautiful soul. Dear Wendy, and you are a beautiful reader with a beautiful soul. Thank you so much. I own a dog and we moved to Tehran 2 years back and this piece just got me into tears. Mine is a Dane and you can imagine how hard it was for me to take him out, just to enjoy something as simple as a walk had become so difficult. Your a great writer, plus you have the same name. 😉 keep up the great work. My name is Barbara and I am a newcomer to Canada and a filmmaker. recently I read an article in the Canadian immigrant magazine written by you. that article made me have an idea for a documentary. If you’re interested to talk, please send me an email. Thanks and happy family day. Dear Barbara, hope you are enjoying life in Canada so far!! Thank you for looking for me, I will be in touch. Happy Family Day to you too.